Scenic hikes in the Smoky Mountains are a great blend of challenge and payoff. There's the challenge of high elevations as you grunt and pull yourself up the mountain. Why? For your payoff! To see that spectacular view waiting just for you. It's a view only birds get to enjoy. There's lots of reasons people come to the Smokies. The one that tops them all is the mountain views. When I'm choosing a hiking trail, the view is the main draw for me too! I love the thrill of making it to the top of the mountain, then basking in the glory of their beauty. Amazing views are plentiful in the Great Smoky Mountains National Park. The Smokies are home to 16 peaks over 6,000' high! Elevations range from 875 to 6,643'. The highest peak is at Clingmans Dome. Check out the following links to more scenic hikes. Mount LeConte, A Hike You Won't Forget! Chimney Tops, Two Peaks in Only Two Miles! Andrews Bald- Views, Wildflowers, and Picnicking! 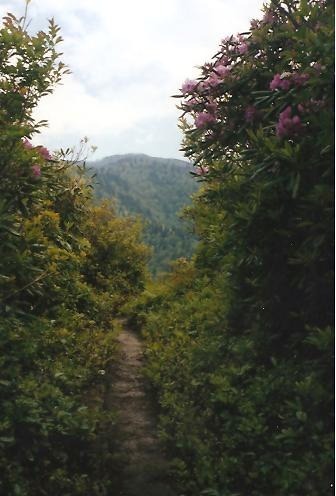 Gregory Bald- Take a Wildflower Adventure with Mountain Views Too! Sugarland Mountain- A Sweet and Solitary Hike!